Mysterious money app sends kids on a mission to keep coins safe while teaching them how to count, add, and subtract coins. They'll also learn a bit about U.S. History at the same time. Money Math: Counting Coins sends kids on a mission. Their job? To help General George prevail over Benny Arnold and retrieve all of the coins. They do that by counting coins and answering a variety of problems involving money. While the game itself focuses on United States history and introduces the civics component, the questions kids answer and problems they solve have little to do with history. Instead, kids will add and subtract coins to see if they have enough money to purchase items or determine how much change they’ll need. They’ll count coins and add up their totals to find matches and find out whether they have more or less than a given total. In the background of each screen, however, they’ll find U.S. landmarks and they’ll also learn about the 50 states as they discover their state specific quarters. All of these activities will help kids accomplish the ultimate mission and feel a sense of accomplishment as they help keep the coins safe. Mysterious music fills the background as kids first open the app and begin to play. While they feel the mystery, they may have a bit of trouble figuring out what’s going on. Everything is clearly labeled, but there’s a lot on the main screen to distract kids from setting up a profile, reading the story, and getting started on their mission. As they play, they’ll discover responsive games that, while designed nicely, lack a bit of the polish they’d find in more developed apps. Instead, coins sometimes randomly appear on the screen, making them hard to count, and some of the pictures don’t quite fit the scene. 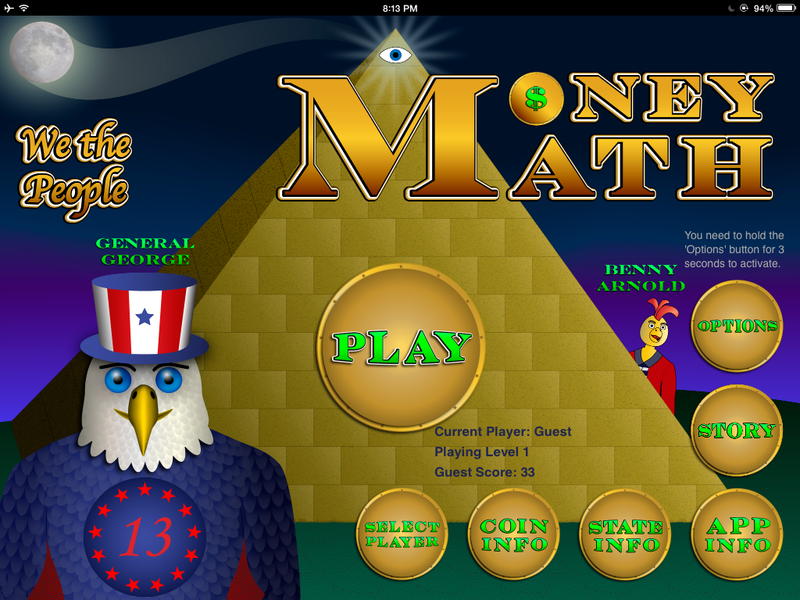 Kids picking up the app will want to learn about money, but they’ll get a history lesson at the same time. The wealth of information and learning potential is impressive, but kids may find themselves focus less on counting coins as they also try to keep up with the various government buildings, state info, and other historical information within the app. When it comes to counting coins, however, they’ll find themselves learning to count coins in multiple ways and gaining a thorough understanding of the value of each coin and who is represented on the front. As kids earn points in the game, they have the potential to unlock special state quarters and drag them to their secret positions on the pyramid. The underlying story doesn’t feel like it quite connects with the tasks of counting, adding, and subtracting coins, but the mystery and mission may be enough to hook kids on the more academic tasks. Despite the slight lack of quality, the nine different games and the wealth of information about states and coins in general justifies the small price tag. Kids will easily find their way to the nine different games and will understand the simple instructions. The random placement of coins, however, may cause some difficulty and frustration as they attempt to solve the problems. Parents and teachers will appreciate the ability to track the progress of up to four learners as they play. However, access to the screen documenting their progress and allowing them to reset their scores becomes accessible only after holding down the options button for three seconds. This will deter some kids, but others will find their way in and gain access to the options.